Thanks to Patrick, and other members at Penn’s CG program, I got the chance to present our IBL work in the DMD senior’s project presentation event. The next phase will be adding shadow into the formula. Check out this post to have a short introduction about Haar wavelets. In order to do IBL using wavelet triple product integral, we need to represent env light, BRDF, and per-vertex visibility by wavelet basis functions, meaning we need to do wavelet transform on these signals. 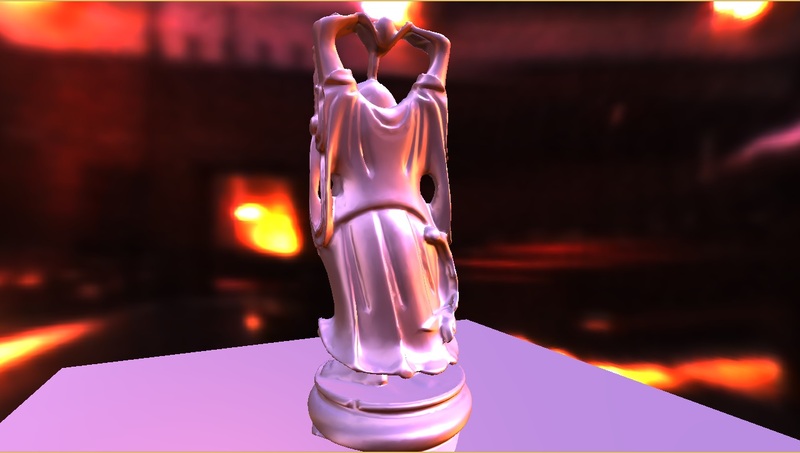 For BRDF and visibility in static scenes, we could precompute their wavelet transform using CPU, in offline; for lighting we have to compute the wavelet transform in run-time, because the lighting is dynamically-sampled in each frame. OpenGL compute shader gives me good incentives to implement 2D Haar wavelet transform in it. Firstly it is an independent compute stage outside graphics pipeline, so I don’t need to supply primitives or setup those graphics pipeline states that are unrelated to the core algorithm, secondly it provides shared memory access for inter-thread communication, just like CUDA or OpenCL, and finally, unlike CUDA or OpenCL, it can access OpenGL buffer objects just like other GLSL shaders. In my implementation, in each frame the light is firstly sampled into an octahedral parameterization using fragment shader, and non-standard wavelet decomposition is performed using compute shader. For a 1-D discrete signal with length N (N>2), we can repeat this average & difference process to obtain 1 scale coefficient and N-1 detail coefficients. Thus the wavelet transform of [ 9 7 3 5 ] is given by [ 6 2 1 -1]. 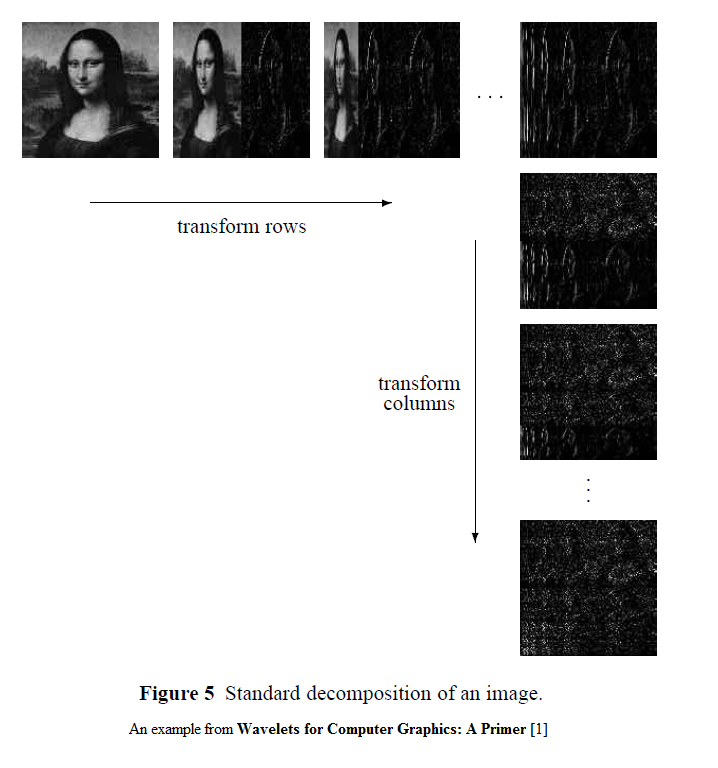 To perform 2D Haar wavelet transform, we can simply do full 1D transform along one dimension and then do another full 1D transform along the other dimension. This is called standard decomposition. 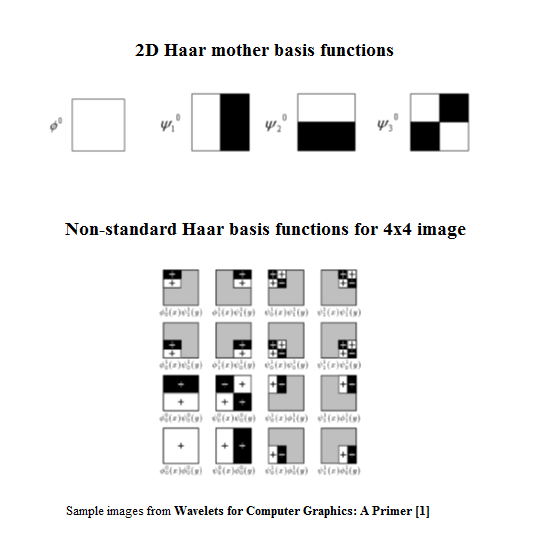 Or, we can perform 1D Haar transform alternatively along different dimensions, in each level. This is called nonstandard decomposition. 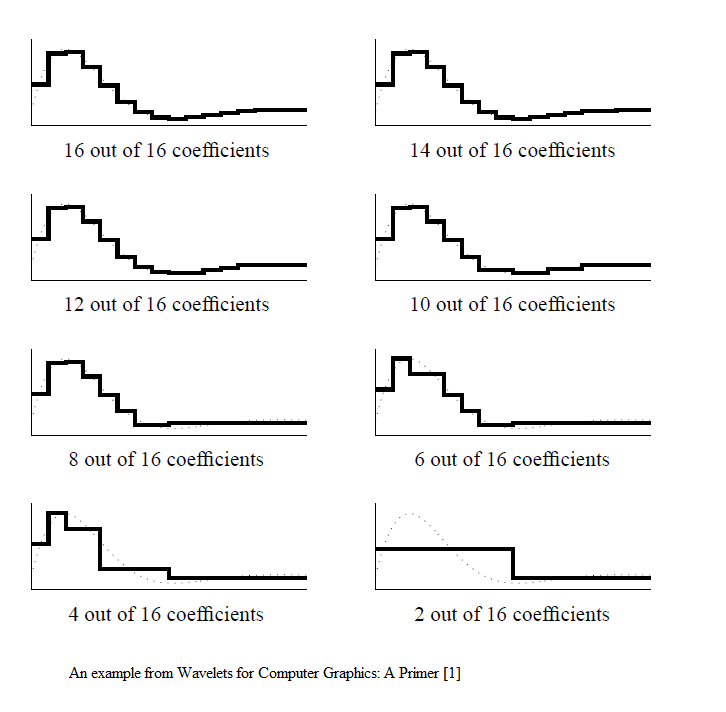 Non-standard decomposition has some desired properties, such fewer assignments are required than in standard decomposition, and square local supports for every basis functions. 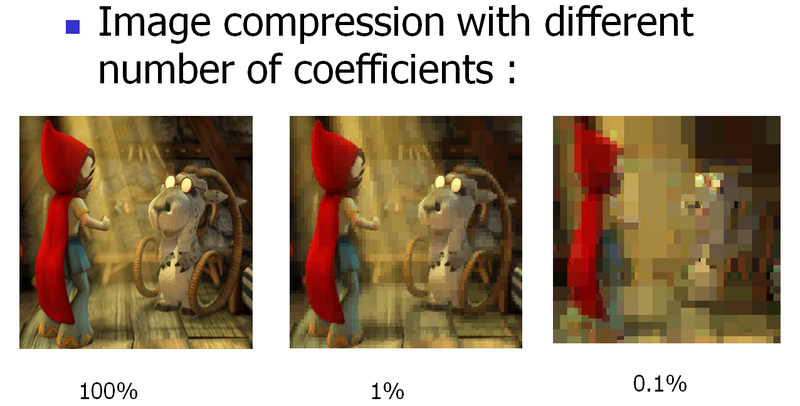 It’s an example produced by my own implementation, and the coefficient pickup scheme is naive (just pick those with large magnitude), so it does not yield best compression quality. 1. Eric J. Stollnitz Tony D. DeRose David H. Salesin, Wavelets for Computer Graphics: A Primer. 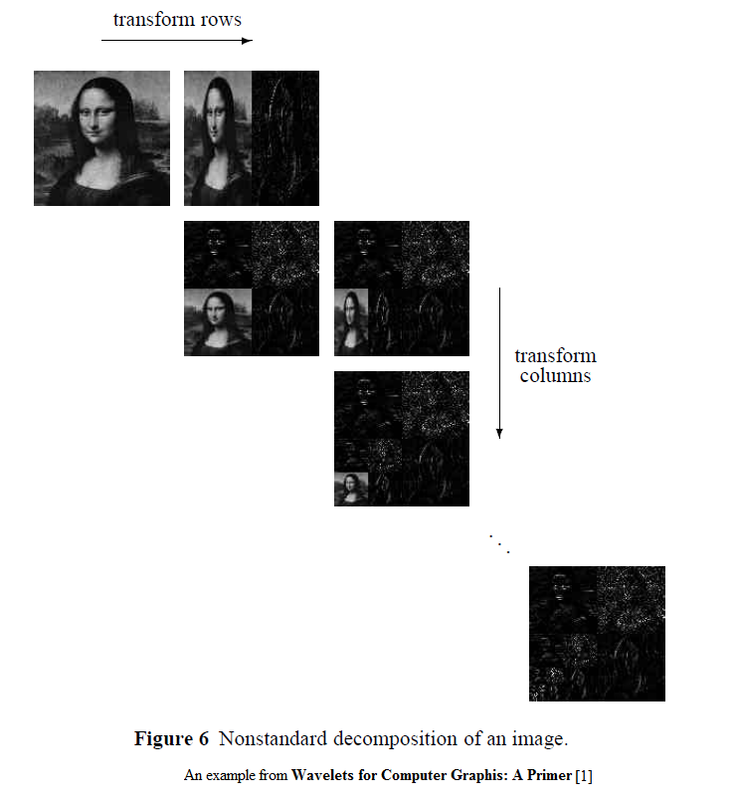 Because compressing a spherical function sampled in cubemap form requires us to do 2D Haar Wavelet transform 6 times, one for each cubemap face, to simplify this transformation step, Wang et al. propose using a single 2D octahedral map to represent a spherical function. So by using octahedral map to store our per-vertex visibility, we only need to do Haar Wavelet transform (# of vertices) times, whereas cubemap representation requires (6 x # of vertices) times. In my implementation, I simply use the converting method provided in  and  to convert 2D coordinates in an octahedral map to 3D direction vectors. The following screenshot shows the visibility cubemap of a vertex, and the octahedral map converted from that cubemap. It’s not easy to imagine what the transformation looks like on a black and white image; I also made a screenshot showing the converted environment cubemap. You can see in the input layout qualifier we specify the GS to be invoked 6 times for each primitive. The invocation id (0~5) could be retrieved via gl_InvocationID. I say “potentially increase the performance” because if the number of input primitives is far larger than that of shader cores, instancing seems not that helpful. I need to do a timing test see if there is difference. 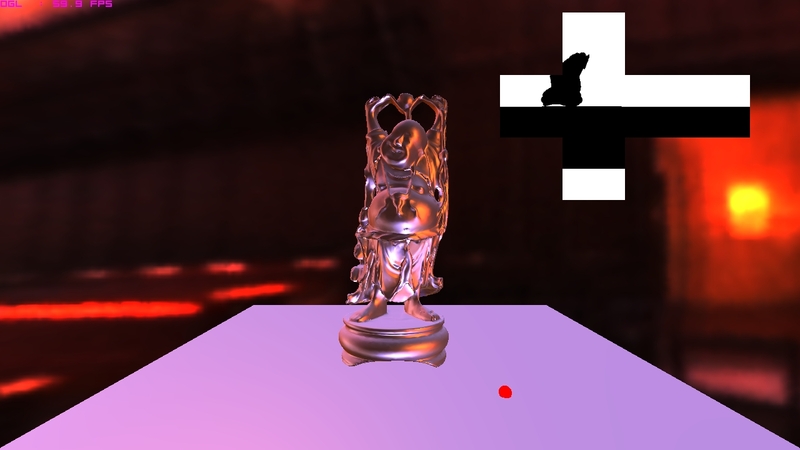 Finally, for per-vertex visibility cubemaps generation, since we know all the rendering parameters beforehand, we can store them in a shader storage buffer or texture buffer, and use instancing rendering to eliminate the redundant API calls. For a scene containing 150000 vertices, using naive rendering loops requires 150000 draw API calls. Ideally, just one API draw call is ever needed when instanced rendering is used. However, because we need to retain each vertex’s visibility map, we need to switch FBO or FBO attachments within the rendering iterations. Allocating 150000 textures is also not a good idea. Because 6x32x32 resolution is usually enough for a vertex’s visibility cubemap, we can somewhat alleviate this problem by using large-dimension, like 6x8192x8192, textures and groups a number of visibility fields into one large texture. And we do instancing rendering with these large textures serving as render target. The number of instancing draw API calls is that of the large textures. In my test scene, which has 175000 vertices, the visibility cubemap generation only takes a few seconds in a machine featuring a nVidia GTX670; I haven’t precisely measured it though. 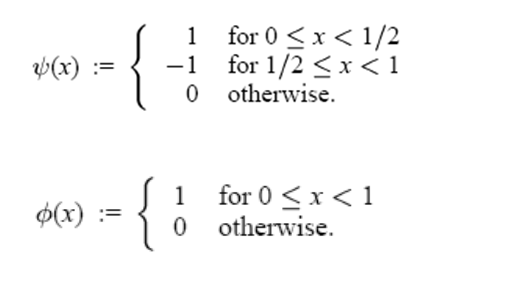 The triple product wavelet integral IBL proposed by Ng et al. enables changing lighting as well as viewing directions by separately precomputing BRDF and visibility functions. 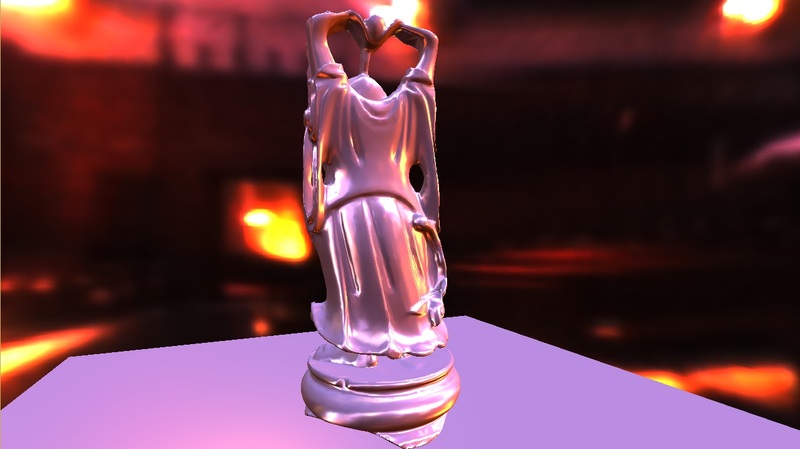 In their implementation, BRDF, visibility, and lighting functions are all sampled in the same global frame. Because BRDFs are usually defined in local frame, Ng et al. precompute BRDFs for a set of orientations (defined in global frame), that is, each single material BRDF has multiple copies for different orientations. During runtime, when shading a vertex, the surface normal is used for choosing and interpolating BRDFs with closest orientations. This approach requires huge memory for storing precomputed BRDFs set. Wang et al. proposes a computational approach for efficient wavelet rotation. 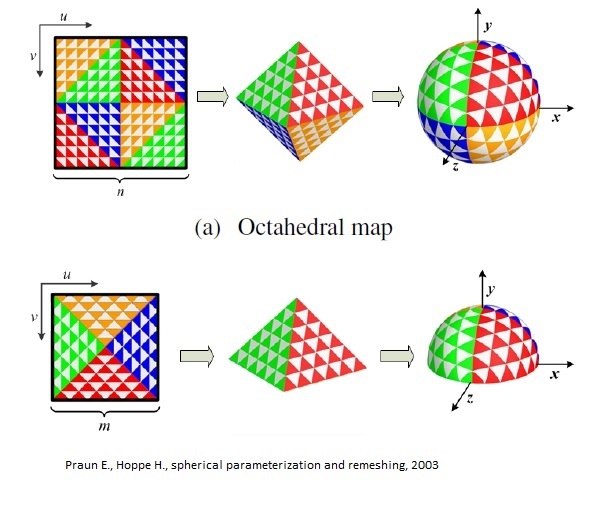 First, they choose octahedral mapping for parameterizing the spherical domain, because it has good uniformity and reduces wavelet rotation to translation in 2D. Second, they precompute a wavelet rotation matrix R per orientation (So they get a bunch of rotation matrices). A wavelet rotation matrix is very sparse because of the compact local support of wavelet bases. Quantization could further reduce the number of non-zero elements. If we have 32×32 predefined normal orientations, we got 1024 rotation matrices. 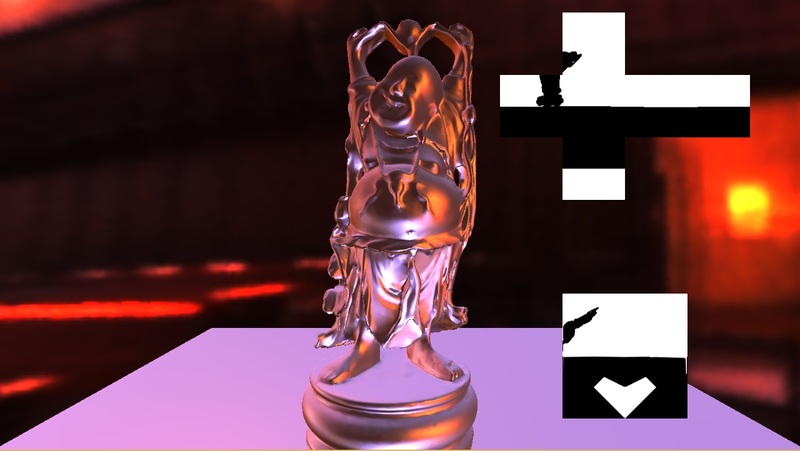 These wavelet rotation matrices are independent of BRDF or lighting or visibility, so they could be computed, stored in disk, and loaded into memory when the application starts. And we only need one BRDF copy for each material. In runtime, the light function is dynamically sampled and wavelet-transformed, and then rotated by those precomputed wavelet rotation matrices to obtain different rotated versions of lighting functions (or more specifically, wavelet coefficients). These rotated versions of lighting wavelet coefficients will then be used for performing shading in each vertex, that is, doing dot-products with BRDFs defined in local frame. Wang et al. doesn’t take into account visibility, so they only deal with dot-products when doing shading. They perform shading entirely on CPU; SSE instructions is enough to achieve near-interactive frame rate. In order to incorporate visibility and perform wavelet triple product integral, we have to precompute the visibility function on each vertex, that is, sampling visibility in spatial domain and wavelet-transforming it. With OpenGL 4.x features, we might be able to shrink the precomputation time to acceptable levels. Back in mid 2000 we had to make 6 drawing API calls per vertex position to generate visibility cubemaps for each vertex; today we could use multi-draw indirect to greatly reduce the number of CPU making expensive API calls. Second, layered rendering with geometry shader make it possible render all 6 cubemap faces in one draw. Third, bindless textures reduces the overhead of repeatedly binding/unbinding those visibility textures when doing wavelet transform on GPU. For Phong BRDF materials, we can do convolution on each environment map texel over its surrounding texels covered by a designated specular lobe. We can store different prefiltered environment maps corresponding to different specular powers in a mipmap chain. Mipmap level 0 contains the envmap w.r.t. 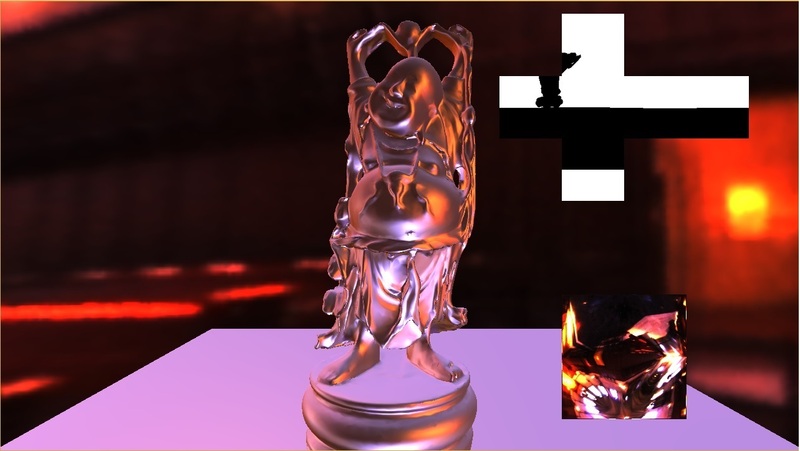 highest specular power, mipmap level 1 contains the envmap w.r.t. 2nd highest specular power, and so forth. Again we can use cubemapgen to help us generate this multilevel cubemap texture. Then we can sample the texture using texturLod, which allows us to specify the desired mipmap level. To enable smooth transition, we also have to enable linear filtering between mipmap levels for this cubemap texture. The following screenshots are my rendering results after adding Phong specular contribution to the final shading.